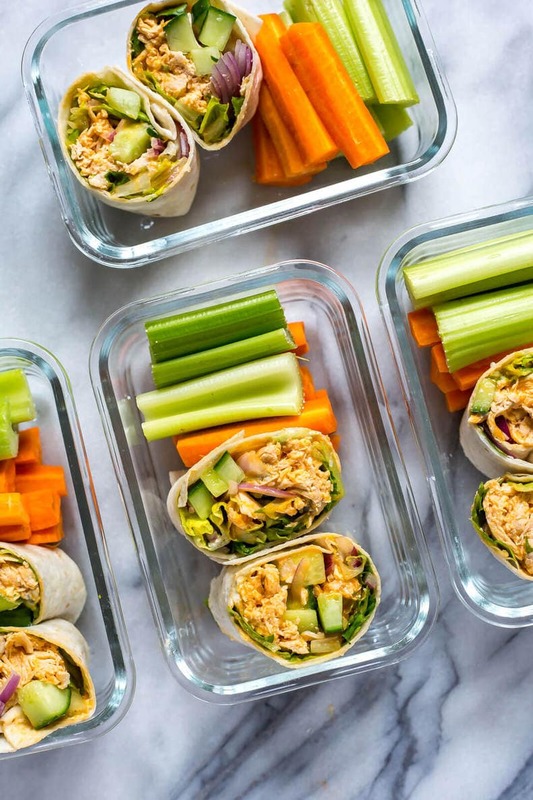 This Ultimate Meal Prep Buffalo Chicken Wrap is a delicious, easy lunch idea that's going to help you get back into a healthy routine - pack them bento box style for your school and work lunches! Add water, salt and chicken to Instant Pot. Cook on high pressure 5 minutes - Instant Pot will take about 10 minutes to preheat, then the 5 minutes to cook. Do a quick release of the pressure, then remove breasts and shred chicken with a fork and knife. Add chicken back to the pot and toss with buffalo sauce. Add romaine lettuce, buffalo chicken, blue cheese, cucumber and red onion to each wrap, being careful not to overfill them. Cut them into thirds, then place two wraps into glass meal prep bowls. Serve with carrots, celery and dip of your choice - wraps will keep in fridge up to 3-4 days.